“I can’t believe I had to say that. I find it very upsetting that grandma said I remind her of you,” blurts our Hannah over a steaming plate of assorted Indian entrees. “You” referring to me, the mommy. You can run but you can not hide. I, quite often, catch a glimpse in the bathroom mirror and see my mom looking back at me. I look at pictures from a few years ago and think, “Damn, I was skinny.” Will I look back at today — a few weeks before my 60th birthday and think, “What was I thinking? I was so skinny and young back then?” I guess it’s better than the alternative . . . not thinking or being at all. Friday babble. Really have to motivate myself to exercise more. I started back at the gym twice a week and kept it up for 2 whole weeks. I was so proud of myself. There I was chatting it up with the crew at the front desk of the gym. “Twice a week is not enough. We have to get you going to the gym three or four times a week,” squeals a-little-miss-trainer-in-underpants. That was it for me. Haven’t been back since. And, you know something else, I’m in the mood for a bon-bon. Oh wait, Hannah and her friends just walked in. 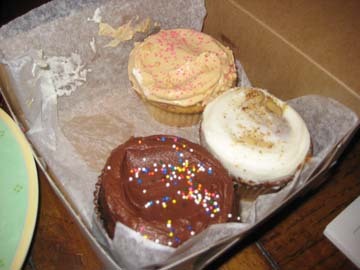 Looks like Anna brought over some cupcakes from Sugar Sweet Sunshine Bakery on Rivington St.. Must be careful. I see nuts. And I also see red velvet. Mmmmm, cupcakes now, bon-bons later. Gym, eh, that can wait. Who ate the red velvet cupcake? Dinner: Iavarone pumpkin ravioli — served with broccoli rabe. Can’t think right now. Activity downstairs. Here we go again. Jumped out of bed at 7:20 am (I am Number 9 ) and checked the trap. It had sprung and it was empty. I reset it and sprinkled some baby powder near it to see if I find teeny tiny footprints later in the day. I’m giving this 2 more days and then I am calling an exterminator. Later in the day: No footprints, no squirrel activity. Picked up Hannah at the train station and she told me the news — she’s in! Columbia School of Public Health wants her. Good thing too. I’d feel bad if her roommate, Anna, had to decline her acceptance out of guilt. Now they can both go and be happy. Congrats to both of you girlies. Going out to celebrate Hannah’s acceptance. Chilli and Curry in Hicksville is Hannah’s choice. I break out in a sweat when I think of eating Indian food in a restaurant. Don’t know why, well, I do know why. I get sick every time. From what I read in cookbooks Indian recipes use ground up cashews in their spices and I don’t think they always know this. But I did eat at Chilli and Curry twice. The first time I felt fine and the next time I think my nerves got the better of me and I felt queasy. I’m willing to try again. When in doubt eat white rice! Ready to go. Drew’s going to meet us there. Printed out a map. I remember last time I drove there I circled the area forever before i actually found the restaurant. Wish me luck! 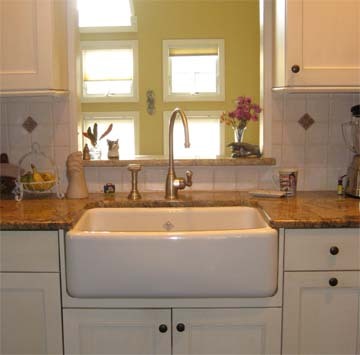 Still love my sink after all these years. I know I’ve given myself a 300 word limit a day but I really really don’t feel like writing right now. Tired. Finished cutting, chopping, and mincing. Cooked up a couple of Indian dishes for dinner and now I get to sit by the front door and wait for my drew. It gets lonely at the door but tonight I get an added treat. Pam is coming in for the night. She’ll probably get here before drew — all the way from Mexico. I feel pretty lucky — I’m guaranteed a visit when they (one or both — Pam and Jan) come into town because the Jetta that once belonged to Rachel now belongs to them and it is sitting in front of my house. I know it’s sad but at least I know I get to see them even if it is a quickie. Tomorrow we get to eat an early breakfast and then go off in different directions. My guess is I won’t see Pam again til it is time for her to head back home to Mexico. I’m okay with it . . I take what I can get. Probably should have checked to see if there is gas in the car. Already dug up the EZ Pass and put it by the keys. My squirrel was very noisy today. I have 3 traps all over the place. I don’t know why he isn’t finding any of them. Maybe I really do have to cook for him. Anybody know of a good squirrel cookbook? Going to wash and soak my basmati rice and sit in the back room and read a book — The Glass Cell by Patricia Highsmith. Dinner is ground turkey curry and peas, palak paneer, and basmati rice. Saving the okra for another day.